It’s been raining on and off for nearly two weeks now. 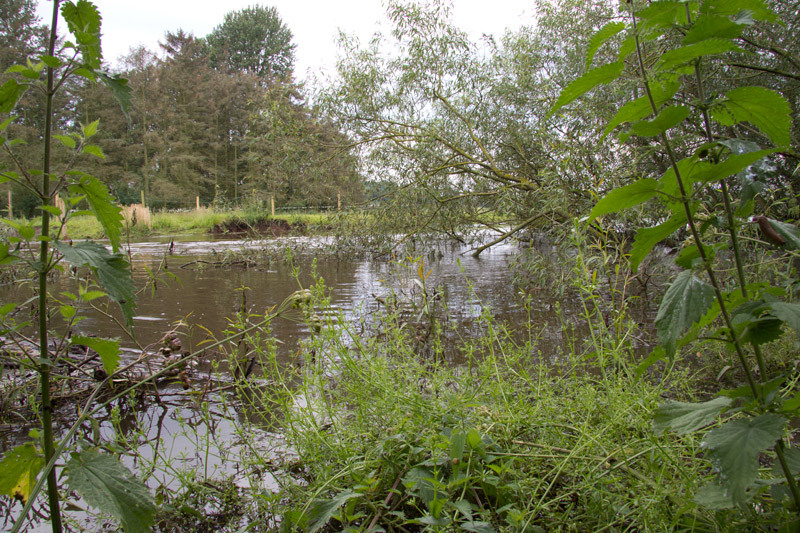 The bank that the kingfishers are nesting in was completely inundated by the end of the first week of July and a week later, the water level is still very high. The kingfishers had just about started mating again in the few days before the rain returned, so at least they won’t have lost any young. However, it does mean that once again their attempt at starting a second brood has been bought to an abrupt halt. With the river being so high, the kingfishers have been regularly seen on the canal and a local ornamental lake over the last few days. Although I saw a cormorant fishing on the river, I can’t imagine that the kingfishers would be able to catch much with the river in its current state. 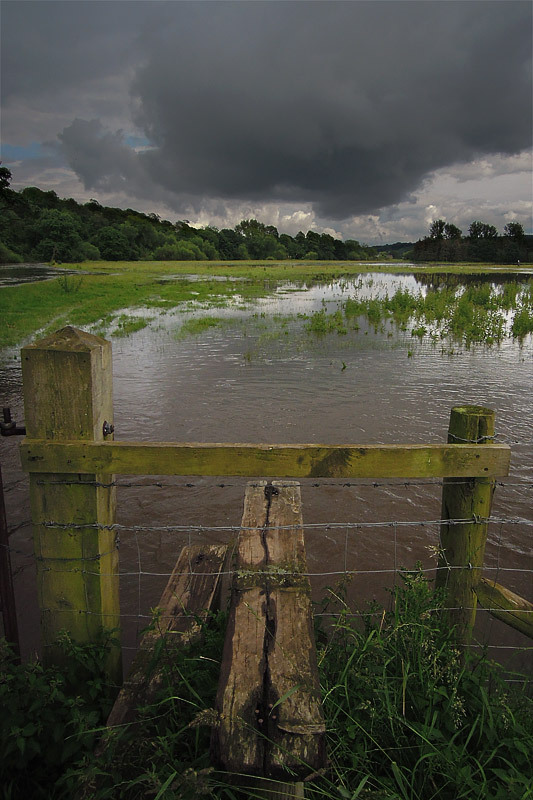 The image on the right shows a stile I often use which has now become a jetty as the River Trent inundates the adjoining field. Fortunately the farmer was quick off the mark and removed the cattle and sheep from the field in plenty of time. Once the river levels begin to drop, it remains to be seen whether the kingfishers will return to the bank to try again. With the river having been high for over a week, I wonder whether the kingfishers instinct to start another brood while they have time will lead them to seek an alternate site away from the river. 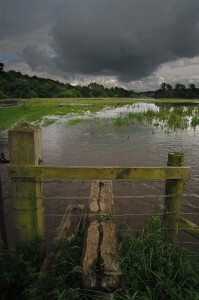 The floods return and the kingfisher nest bank takes a pounding. On the day that the kingfishers began incubating their second brood the rain started again. A week later and the water levels are pretty much where they were during the floods in April. During my visit to the nest site on Saturday 9th June, I’m horrified to see a substantial section of the bank directly beneath the kingfisher burrow collapse into the river. The kingfisher burrow entrance, that had been in the middle of a smooth bank face, was now overhanging a gaping hole where the bank had collapsed away. When the collapse happened, the female, who was incubating at the time, immediately exited the burrow and seemed very reluctant to return to the nest. She repeatedly flew across the river and hovered near the burrow entrance, but just didn’t seem to have the confidence to enter. A few minutes later she flew off downstream. Fortunately, the male returned to the nest shortly afterwards and flew straight into the burrow as if nothing had happened. I stayed on site to wait for the female to return and I’m pleased to say that an hour later she returned. She perched opposite the nest and called to the male, who immediately flew across to perch next to her. A few seconds later the male headed off downstream and the female flew across to the burrow and entered. The following morning both birds were continuing to take shifts brooding and the water level had receded a couple of feet, exposing more of the chasm below the nest burrow. The nest chamber itself is about 2-3 feet into the bank, but if the top section of the bank collapses, it’s anyone’s guess as to whether the nest will remain viable. 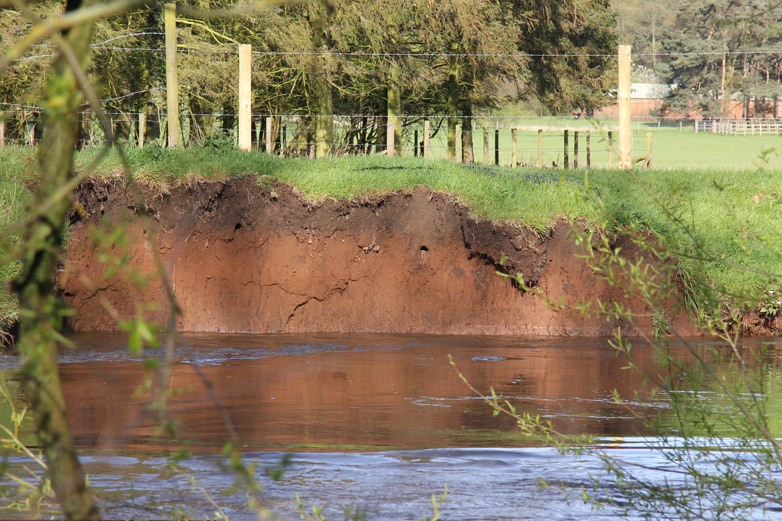 In a final turn of events, the disused burrow to the right of the kingfisher nest was once again being visited by Sand Martins on Sunday morning. The martin’s were present most of the time I was there (about 3 hours), perching at the burrow entrance and entering, sometimes two at a time. Whether they’ll move in this time remains to be seen. I captured some fascinating footage on Monday when I went to check the flood water levels. All in all it was a great session, the water levels had dropped again, I had a brief glimpse of an otter and then I noticed that we had some new potential residents on the bank. A pair of Sand Martin’s are in and out of the burrow on the right hand side of the bank. This is where they nested last year, so it looks like they favour the location. From what I could tell last year, the kingfishers pretty much ignored the sand martins, but I’m not so sure that this years female is as tolerant. In the clip you can see her hovering along the bank face, obviously agitated, and then, in a move that surprised me, she perches at the sand martin burrow entrance and goes all the way inside. I assume having only just arrived, there are no eggs yet and there were no martins inside at the time, but this seems quite bold behaviour from our female. It’ll be interesting to see if the martins stay put, or are evicted by the kingfishers. I spent a couple of hours this morning at the kingfisher nest. Both adults were entering the burrow with fish, some of which were quite large. 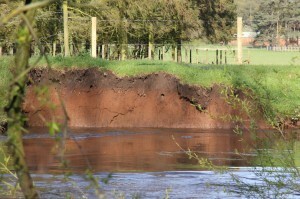 The flood water has receded further and is now about 3-4 ft below the burrow. I think it will drop further after today’s dry weather before it starts to rain again tomorrow. The big news this morning though was not the kingfishers. At about 7:30am, I was inside my hide, waiting for the kingfishers to return when an otter surfaced about 15ft in front of me. It cruised along on the surface for about 5 seconds and then as quickly as it appeared, it was gone. I’ve never seen a freshwater otter in the wild, so this was a bit special for me to say the least. I foolishly suggested that the kingfisher nest was high enough up in the river bank to be safe from flooding a couple of weeks ago. Well, words definitely do come back to haunt you don’t they? After variable showers throughout April, I’d been happy to see that the water level in the river was maintaining a reasonable flow, higher than it has been but still several feet below the kingfisher burrow. On the 22nd of April however it began to rain harder. It cleared somewhat on the 24th and then on the 25th it pelted down, but more to the point it also pelted down in the areas where the headwaters of both river systems that converge upstream of the kingfisher nest are located. The result has been a rapid rise in the water level, which I first noticed while driving home on the 26th. The meadows I drive past alongside the river having turned into a lake and the water levels close to the top of the arches on the bridges. When I got home, I changed quickly and headed to the river (fortunately in wellington boots), and found the bank inundated. Thankfully, on the far side of the river where the kingfisher nest is, the burrow was still above the water line. The next question I had was; have I arrived at high water, or has it been higher and receded? The only thing for it was to wait and see if the kingfishers were still taking food into the nest. After a tense wait of 15 minutes, during which a kingfisher flies past the burrow but doesn’t stop, both birds suddenly arrive in a flurry opposite the nest. I can see the female has a fish, and a few seconds later she flies across the river and enters the burrow. The male enters shortly afterwards and then exits and heads upstream, the female stays inside the burrow for the rest of the time I’m there (about another 20 minutes). So, it was with some relief that I left the nest site today, but this is very much tempered by the weather forecasts for the next few days. Tomorrow rain is forecast again all day and then, after a break on Saturday there’s more to come on Sunday and into next week. If the flood abates and the rain isn’t too concentrated, then hopefully the levels will drop or at least not increase. If it gets any worse, the kingfishers are in big trouble.